This unit appears to have had little if any use. It was held as a spare on a gas project. The cloth bag in the bottom bin had some sawdust in it, but the internals of the vacuum are perfectly clean - see photos. "Equipped with 3 bypass motors for heavy duty use to control energy consumption due to energy requirement. Easy to use thanks to the control panel supplying real time data about the vacuum efficiency, it is light but strong. L, M, H certified for the collection of hazardous dust. The Nilfisk S3 Single Phase Industrial vacuum is equipped with a control panel supplying real-time information about the vacuum efficiency. It is available with 50 or 100 L containers, in stainless steel, with gravity unload system (plastic bag or Longopac), L-M-H certified or with absolute filter for the collection of toxic or fine dust, with nomex filter (ideal in case of collecting of hot substances), with electric filter shaker. 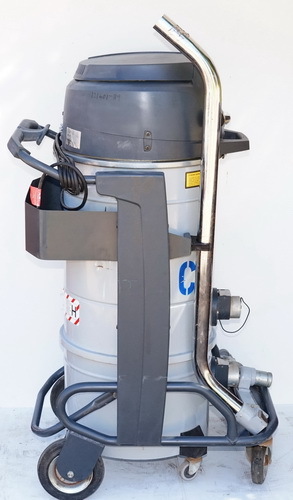 This vacuum can be customised to suit any application, from wet vacuuming to asbestos collection."